At a bar, Gizmo is busy drinking and humming to himself when another robot steps up and asks to join him. Gizmo readily accepts the offer and “Digger” pulls up a chair. As they talk, Digger is taken aback by the fact that Gizmo, a robot, “grew up” like a human child and, despite being 273 years old, looks like a gent of 25. Gizmo-himself can’t explain it, but merely shrugs it off as life is just too hectic to dwell on such things. Digger, however, has a less pleasant history. Formerly a miner, he was left without a job when the company shut down the operation. While other bots of his model chose to run down, he decided to pick up his shovel and look for more work… to no avail. Suddenly having a brainstorm, Gizmo runs and grabs an acquaintance of his at the bar, a mining operator named Grok. Grok needs robots who can dig by hand to work a contract on the Neztl plain. Thrilled at the opportunity for years of work, Digger takes the offer. As Digger strides out, he remembers he still has to pay his tab. Gizmo waves him on, offering to get it for him. *This story has never been reprinted. This was a nice little character-centric story. Michael Dooney once described the theme of Gizmo as simply being that of enduring friendship and kindness, which is pretty evident in this fairly saccharine tale. Stories like “Reflections on a Metal Face”, focusing on Dooney’s theme of comradery and charity, create an interesting contrast to the earliest Gizmo comics, such as “Our Hero, Gizmo Sprocket esq.” and “Shopping Spree”. In those original appearances, Gizmo is this outlaw with an attitude, making trouble where he can find it; stealing from casinos and antagonizing law enforcement officers. It comes as something of a juxtaposition with his later appearances, where he’s almost generous to a fault. 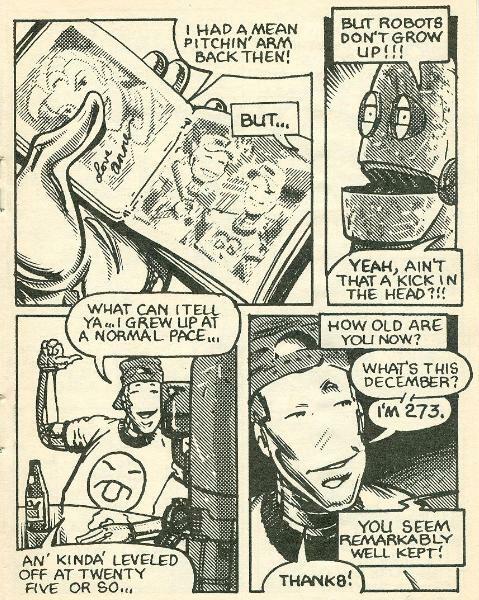 Being written in 1989, “Reflections on a Metal Face” came after the six-issue Gizmo ongoing series refined the character, his motivations and his personality. There isn’t much else to say about this mini comic, aside from the brief glimpse at Gizmo’s unconventional robotic “childhood” certainly raising some questions. While we got a number of stories focusing on companion character Fluffy Brockelton’s history, at least regarding his war record, Gizmo Sprocket’s background rarely came into play. I don’t know if I’d qualify this as an “essential” Gizmo story, and Mirage’s Mini Comic Collection wasn’t one of their finest publications, though if you can get the set for cheap then you might as well go for it.